A beautiful piece of classic art nouveau furniture; this item has recently been acquired from a local house clearance. 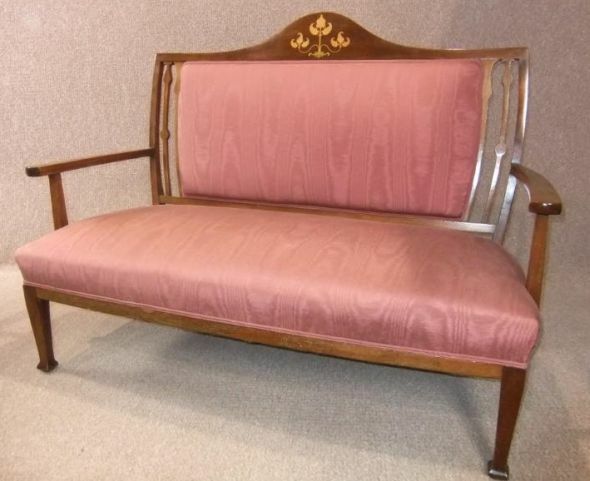 This art nouveau sofa features a beautiful inlay to the top of the centre rail. It is upholstered in a beautiful shot silk material, and stands upon elegant, square tapering legs. Each side is decorated with a curved down slat with heart shape motif, making this quite an unusual piece. This art nouveau sofa is well made and in lovely condition for its age. All of the upholstery is in good order, but in some point during its lifetime, one of the side seams has split slightly, and has been re-stitched by hand in a matching coloured cotton. This does not detract from the overall beauty of this piece of extremely functional and decorative furniture.